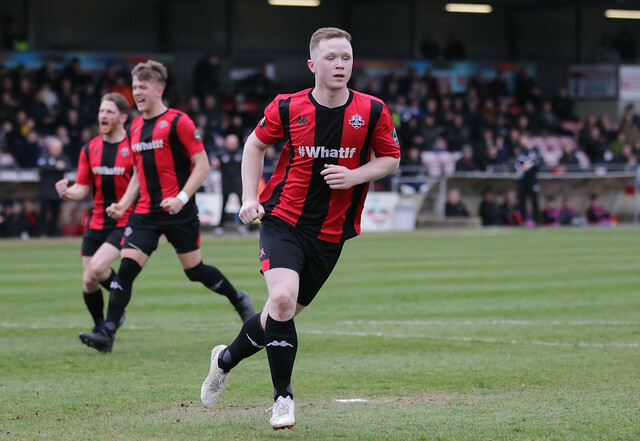 A first-half goal from Ben Pope was not enough to help Lewes record back-to-back wins for the first time since January, as the Rooks fell to a 2-1 defeat at promotion-chasing Haringey Borough, reports Tom Harper. Darren Freeman named an unchanged side after last week's 3-0 win at Kingstonian, with the Rooks looking to build on one of their best displays of 2019. Haringey started brightly, and saw both Rekim Richards and Lyle Della Verde go close early on. It was therefore not a huge surprise when the hosts took the lead after 16 minutes, as the unmarked Coby Rowe headed a Dimitrius Froxylias free-kick past Lewis Carey from close range. Lewes responded well and equalised just five minutes later through Ben Pope, who exchanged passes with Harry Reed before finding the bottom corner from just inside the area. The Rooks enjoyed arguably their best spell of the game following their goal and should have taken the lead minutes later, as a Kieron Pamment cross from the left picked out Charlie Coppola, who saw his effort from point-blank range superbly saved by Valery Pajetet. Despite this, Haringey finished the first half on the front foot, with Kudus Oyenuga, Joel Nouble and Della Verde all going close to putting the hosts back in front before the break. Haringey started the second half in the same way they had finished the first, and saw both Oyenuga and Froxylias denied by Carey in quick succession after the restart. Lewes were being restricted to occasional long-range efforts, but one such 35-yard strike from James Hammond only just cleared the bar with Pajetet beaten. The hosts scored the second goal their start to the half had deserved just before the hour through Froxylias, who cut in from the right and beat Carey with a low effort that hit the inside of the far post on its way into the bottom corner. The Rooks were continuing to find it difficult to create clear-cut opportunities, with a Stacey Freeman header straight at Pajetet from a Pamment corner being the closest they came to drawing level for a second time. It was Haringey who came closest to scoring in the closing stages, as Rowe saw a goal-bound header blocked on the line before substitute Jorge Djassi-Sambu's effort on the rebound was also kept out by some fine last-ditch defending. The hosts also saw Karl Akinwande thwarted by the impressive Carey in the final few minutes, but it made no difference to the result, as they comfortably saw out five minutes of injury-time to consign Lewes to defeat in North London. After the game boss Darren Freeman reflected on a good performance when he spoke to Barry Collins. Lewes will hope to bounce back when they host Merstham next Saturday, kick-off at 3pm. Haringey Borough: Pajetet, Richards, Olufemi, Mitchell, Kirby, Rowe, Della Verde, Aresti (Staunton 77), Oyenuga (Akinwande 64), Froxylias (Djassi-Sambu 68), Nouble. Lewes: Carey, Dome-Bemwin, Reed (Lawson 64), Day, Chappell, Freeman, Banya (Adeyemo 84), Hammond, Pope, Coppola, Pamment (Golding 76).